Nigel G. Mitchell - Author, Blogger, Geek: Bizarre Books: "She'll Never Get Off the Ground"
Bizarre Books: "She'll Never Get Off the Ground"
Today's bizarre book is She'll Never Get Off the Ground by Robert J. Serling, not to be confused with his brother Rod Serling of Twilight Zone fame (seriously). Robert wrote many novels, mostly with airplane themes, bearing subtle titles like his bestseller The President's Plane is Missing and Air Force One is Haunted. Yet in his obituaries, this book is mentioned front and center. She'll Never Get Off the Ground is about the then unheard-of notion of the first female commercial airline pilot. Of course, today female pilots are common, but in 1971 this was tantamount to science fiction. The best part about this cover, to me, is how they put a question mark and exclamation point after "a woman airline pilot." Because without them, one would get the idea that it's an inspiring story about female emancipation. But with them, it's like the cover is telling you, "What?! A female airline pilot? I know, it's crazy! Oh, those wacky ladies! Get ready to laugh, fellas!" It might as well say "a canine airline pilot...?!" 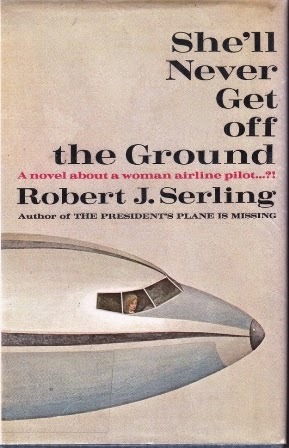 The novel is about the oddly-named Dudney Devlin, who decides to become the first woman pilot in a fictional airline. Along the way, there seems to be a romantic subplot with a widowed co-pilot. From what I can research, it seems like it's actually a fairly insightful overview of what it's like to train to become a pilot on a 737 of the time period. One review seemed to find it a little too detailed. But the cover is a perfect snapshot of a simpler and more sexist time.